Drip irrigation is the most efficient way to deliver water to plants. However, it needs to be monitored and expanded as plants grow. Otherwise, you will end up with super saturated spots surrounded by dry soil. This is not an optimal environment for plants (See Soils chapter). Drip irrigation is typically installed in one of two ways: point-source or dripline. We highly recommend you use pressure-compensating emitters with either method. Otherwise, it is easy to get over-watered areas and dry areas on the same line, even if the area appears to be level. New installations or conversions should contain a screen filter and a pressure regulator right after the valve. Drip emitters have very small holes that can easily clog. Because drip systems operate at a low volume of water, you want to be sure your pressure is not too high or it will blow up your system. Pressure regulation is a must! Point-source drip can consist of either ¼” tubing (sometimes referred to as spaghetti tubing) or standard ½” tubing (There are other, less common sizes). Because ¼” is so narrow, limit length to 10 feet or less for each use. If you have ¼” tubing going to each plant, this will need frequent inspection. ¼” tubing tends to get moved out of place by critters, people, equipment, and even strong wind. It can be unknowingly cut by garden tools. It also tends to detach itself easily from its water source (typically connected to a larger drip tube or multi-port device). 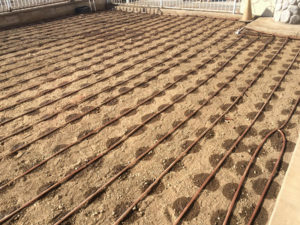 Landscapes provided with this type of drip irrigation will need additional drip tubing and emitters added as plants grow. The ideal is to apply water within the root zone and a little beyond. In addition to irrigating the area of current root growth, you will want to add enough emitters to irrigate a little beyond the current roots to encourage new root growth. Image courtesty of Rain Bird, Inc. Typically, ½" tubing is used for this method. Tubing can be purchased with built-in emitters at regular spacing such as 12, 18, or 24 inches, and with a choice of flow rates. This is called dripline or in-line drip tubing (We will refer to it as dripline). If you want to install your own emitters, you can purchase blank tubing and insert emitters where desired. A grid layout provides the most uniform application of water for optimum plant growth. This is typically used an areas of dense planting. Use pressure compensating emitters to get the most even application of water. Use the same manufacturer for all tubing and fittings because they vary in size between manufacturers. Guides are courtesy of Rain Bird, Inc. Trees need more than two emitters! HOWEVER, once the tree starts rooting into the native soil, additional emitters need to be added around the tree and farther out from the trunk so the roots will have an extended environment in which to grow and spread. How many emitters should you add? See the end of the IRRIGATION SCHEDULES page. After about two years, the two emitters near the trunk should be permanently capped or removed because the feeder roots are no longer right next to the tree trunk. People don't realize trees and shrubs in optimal environments have root growth that extends two to three times the width of their canopies! You will find many recommendations to water just under the canopy. But for optimum growth and health, you want to water where most of the roots grow, and this is at, and slightly beyond, the canopy.